Home » video » How to Convert and Add M4V to iTunes to Play M4V in iTunes? How to Convert and Add M4V to iTunes to Play M4V in iTunes? Though M4V is a native supported video format by iTunes, sometimes it is still unable to import M4V into iTunes for Windows or Mac. Even if we have successfully added M4V to iTunes, we still fail to play M4V in iTunes or transfer M4V to iPad/iPod/iPhone/Apple TV. Is M4V supported by Apple devices? If yes, why we can't add M4V to iTunes (including the new iTunes 11)? This article will explain the reason why iTunes won't import M4V video files as well as provide the solution on how to solve can't import M4V to iTunes issue. Why iTunes won't Import M4V Video Files? Though M4V is developed by Apple and is used to encode TV episodes, movies, and music videos in the iTunes Store, not all M4V files are produced by Apple and supported by Apple devices like iTunes, Apple TV, iPad. So if you got the M4V video from someone or somewhere instead of iTunes Store, iTunes will refuse to import and play those M4V files (especially the M4V movies that are not purchased through iTunes or the M4V video created using CloneDVD Mobile, downloaded from websites, converted by HandBrake or Toast 10 and etc). How to Successfully Add M4V to iTunes? In order to successfully import M4V to iTunes to play M4V in iTunes or sync M4V to iPad/iPhone/iPod/Apple TV, a recommended solution is to convert M4V to a format that iTunes can handle such as MP4, MOV. 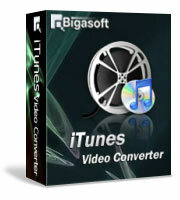 Bigasoft iTunes Video Converter is just the right M4V to iTunes conversion software! It can fast convert iTunes unsupported M4V video to iTunes supported one. Besides converting M4V to iTunes, Bigasoft iTunes Video Converter also helps to convert other video formats like AVI, WMV, MKV, WTV, VOB, FLV, MPEG, 3GP, MXF, MP4, MOV, MVI, RMVB, F4V, SWF, ASF and etc to iTunes MP4 or MOV. 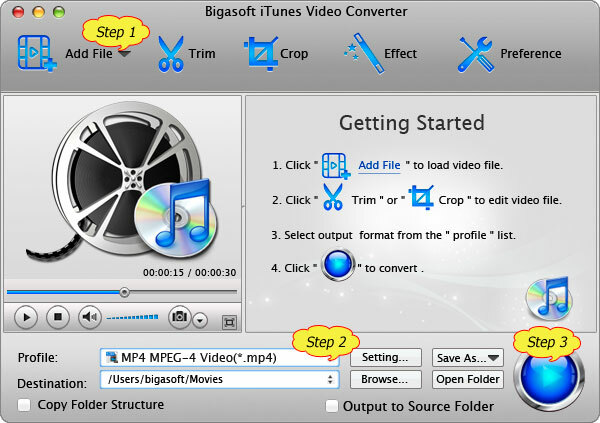 The following is a step-by-step guide on how to convert M4V to iTunes with the help of Bigasoft iTunes Video Converter. Note: This guide does not apply to convert a protected M4V by using Apple's FairPlay copyright protection. Free download, install and launch the professional M4V to iTunes Converter - Bigasoft iTunes Video Converter (Mac Version, Windows Version). Import the M4V file which can't be added to iTunes to Bigasoft iTunes Video Converter by clicking "Add File" button or by drag-and-drop. Usually the default output profile is iTunes supported MP4 video format, if you want to convert M4V to iTunes MP4, just ignore this step. To convert the M4V format to iTunes MOV, click the "Profile" drop-down button, and then choose MOV - QuickTime(*.mov) from the "General Video" category. To Convert M4V video to iTunes supported audio format, select MP3, AIFF or M4A from the "General Audio" category. Click "Convert" button to start and finish the M4V to iTunes format conversion. Start iTunes, and then import the converted M4V to iTunes by choose File > Add File to Library option or by drag and drop method. It is that easy to play M4V in iTunes or Apple TV or transfer M4V to iPad, iPhone, iPod for playback on the go with the above step-by-step guide and M4V to iTunes Converter. Wait no more, simply free download this software to give it a try now!